On december 18, 2010, in the forum of the market of solar photovoltaic (PV) and equipment manufacturing of China, Shi Dinghuan, who is the director-general of Chinese Renewable Energy Society, said to many solar photovoltaic (PV) companies, that all solar photovoltaic (PV) companies need to adjust the business development strategy at the end of this year according to the market conditions. In 2011 it’s expected we should to consider the adjustment for solar photovoltaic (PV) products. After this year’s rapid growth of the industry of solar photovoltaic (PV), overcapacity will exist sometimes next year (2011). This year, the growth of solar photovoltaic (PV) industry is rapider than expected, close to double. And the production on silicon, silicon chip, solar battery components is wave after wave. The statistics show that by 2011 the solar battery manufacturers, which have annual production capacity of more than 1GW, have reached 11. The total chaim, from the solar battery to the solar component, may be overcapacity due to the concentration of the release of production capacity. 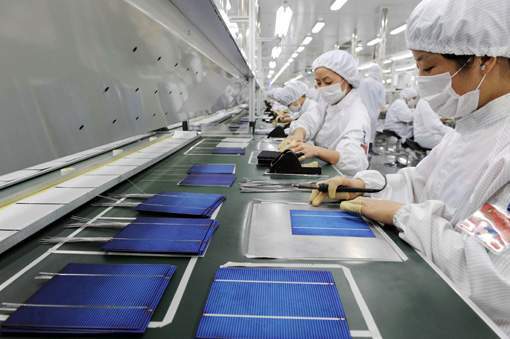 A manufacturer of solar photovoltaic (PV) products said in 2011 China’s solar cell production capacity is expected to reach 35G. But the global demand will not exceed 20G. So the surplus of more than 50% will appear if all the domestic production capacity in China is applied. Solar photovoltaic (PV) industry chain is expected to be concentrated toward upstream industry. Several hundreds of small and medium manufacturers of solar components will be affected badly in this situation in China. Tthe relative overcapacity will exist in the field of solar batteries. The small solar photovoltaic (PV) companies, who is far away from the terminal market, will be impacted seriously. A major production base in Ningxia, PV module manufacturers in the meeting on the sidelines of the China Securities News, said that at the end of the year 5 the world’s largest solar exhibition and ordering – Germany intersolar exhibition, a total of nearly one hundred of Chinese light V exhibiting companies, but companies can successfully get the orders are not many low-cost competitive strategy has not brought a corresponding increase in orders, and many downstream firms overseas can bring about such a cheap quality assurance and how to maintain business survival expressed doubts . Shortage experienced in product orders, while the current corporate cash flow and liquidity, the situation is not very optimistic. Julia told reporters at the meeting, from 2006 to 2008 first quarter, the photovoltaic business financing through the capital market is very active, many Chinese solar companies listing overseas financing, but since the economic crisis to the first quarter of 2009, capital financing markets basically shut down. In the indirect financing market, the European Investment Bank as an example 22, 6% of the banks cut lending new energy, 12% of the banks lending to domestic projects, another 30% of the Bank loans only for short-term borrowings , while no longer involved in solar projects frequently 15-20 years of credit, the proposed increase in bank lending new energy is only 10%. Julia said that this year’s solar energy project finance in Europe in 2007, compared with 20% -40% down. Liu Qing said the solar energy industry as the largest consumer located in Europe, Chinese enterprises are mainly from overseas orders, so Zaimu Qian dominated for outside the case, short-term industry recovery is difficult. Financing of the closure of the industry increased the difficulty of recovery and expansion of domestic enterprises more difficult. Market research agency iSuppli expects the global solar power system installed this year, the amount of 32% less than last year, substantially to the global solar energy industry in 2011 will recover, then the world’s total installed power generation system is expected to grow 57.8% for three consecutive years.